Whether you are looking at getting closer to nature, or just looking for someplace that is tranquil and quiet while still being close to a major city, then Nukakamma Guest House is for you.The name Nukakamma is the Xhosa name given to the Sunday River, it refers to the banks of the river that are always lush and green, despite the arid terrain it runs through. Accommodation offered consists of four beautifully furnished bedrooms, each uniquely styled with original wooden finishing, smooth cotton linen and an authentic African appeal. One room is fully equipped for self-catering and features a kitchen, lounge, dining room and private deck with barbecue.Timeless view of the Addo Elephant Park are enjoyed from each room, while their private entrances allow guests free access and independence. A delicious breakfast is served each morning The Sundays River can be traced back to its source in the Compassburg Mountains near Nieu-Bethesda. The small town of Colchester, situated east of Port Elizabeth, is the site where this magnificent river meets the Indian Ocean and is also the entrance to the world renowned Addo Elephant Park. 100% deposit required to confirm booking. We stayed only one night in this lovely Guest House next to the Addo. The rooms were pretty, the meal, which is offered on demand, was selfmade by the very kind manager of the Guest house and delicious. We really enjoyed staying in Nukakamma and will go there again for sure! Very welcoming hosts. Very well appointed accommodations. Would recommend highly to any visitor. Excellent location for Addo Park. This place is fantastic! The space is beautifully put together and the location is really convenient to Addo Elephant Park and the Sundays River sand dunes and beach. Natalie made the house warm and welcoming with homemade muffins and accommodating use of the braai. I'd recommend this place in a heartbeat! 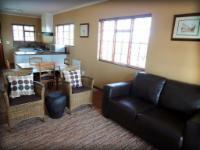 Nukakamma Guest House is 0.7km from the centre of Colchester , the nearest airport 40.7km (Port Elizabeth Airport).